Birth date and place c. 1824 West Church, Edinburgh, Midlothian, Scotland. Civil Census Residences Greenside Street, Greenside, Midlothian, Edinburgh, Scotland (1841). Physical Description Height: 5 ft. 7¾ ins. Complexion: dark. Eyes: blue. Hair: dark brown. Marriage date and place 2nd 18 Jun 1857 (Widower). Children of 2nd Marriage Pultenay Edward 1857, Western Australia. 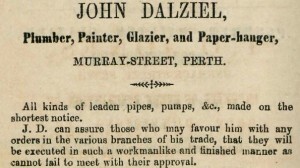 John George 1858, Perth, Western Australia. Martha Jane 1861, Perth, Western Australia. Eliza Matilda 1863, Perth, Western Australia. Lucy Agnes 1865, Perth, Western Australia. Arthur William 1866, Perth, Western Australia. William Robert 1868, Western Australia. Walter Parham 1870, Perth, Western Australia. Ernest Robert 1877, Perth, Western Australia. 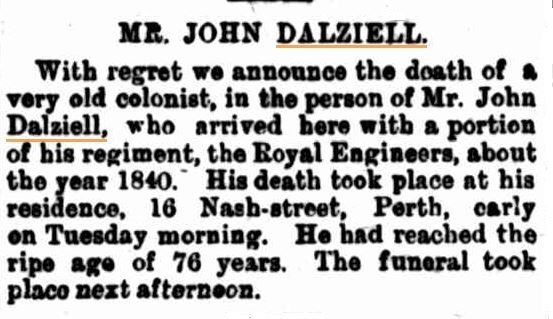 Death date and place 17 Jul 1900 16 Nash Street, Perth, Western Australia. Burial date and place July 1900 Karrakatta Cemetery, Western Australia. 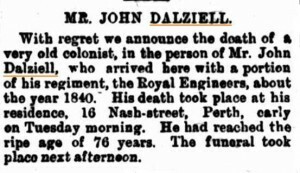 Death Notices West Australian 18 Jul 1900. Western Mail 21 Jul 1900. Service No. and Rank #414 Private. Attestation date and place 8 Jul 1841 Edinburgh, Midlothian. Service/Campaigns Gibraltar 6 years 126 days. Western Australia 8 years 178 days. Musters WO11-130 (1851) to WO11-175 (1860) Western Australia. 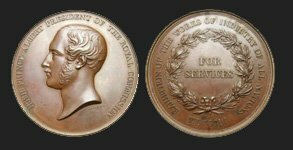 Promotions & Reductions Private to 2nd Corporal 1 Dec 1847. 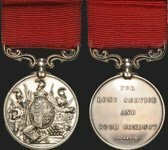 2nd Corporal to Corporal 1 Nov 1849. Corporal to Private 1 Jan 1850. Private to 2nd Corporal 15 Aug 1855. Regimental Court Martial 1 Jan 1850 Woolwich. Being out of barracks after Tattoo. Discharge date and place 16 Jun 1860 Perth, Western Australia. 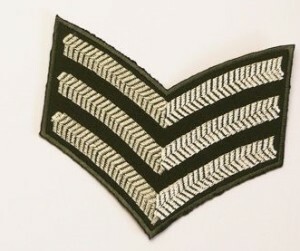 Length of Service 8 years 312 days. Pension 6d. per diem on attaining the age of 60, with pay for 12 months. Mt Eliza Convict Depot Feb 1852 to Dec 1854; Jun to Dec 1855 (at least). 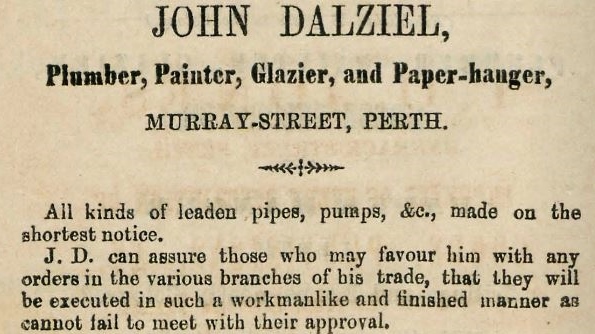 Plumber, Painter, Glazier & Paper Hanger, Murray Street, Perth. Land Acquisition Eligible for £10 remission on 20 acres of land [CSR499-15]. His discharge is proposed in consequence of his having been granted a free discharge with right of Registry for the deferred pension of six pence per diem on attaining 60 years of age with Pay for 12 months (Art. 26: page 176: Queens Regulations) per authority of His Royal Highness the General Commanding, dated 13th February 1860. [WO97-2620-63 Chelsea Pension Army Service Record].